This thesis investigates whether bilingualism affects children’s perceptual acquisition of the speech sounds of their native languages. The term bilingual is used here as synonymous with simultaneously bilingual, i.e. those speakers of (typically) two languages who have been exposed to both languages from birth. This study takes an experimental approach. Bilingual and monolingual children and adults participated on a longitudinal study in which their perception of a Dutch vowel contrast was tested. Participants’ responses were analysed in terms of cue reliance, i.e. how much they rely on different acoustic cues in their perception of a speech contrast. The results discussed here suggest that, although at a certain point in their development bilingual and monolingual children have identical perceptual behaviour, they differ in their developmental paths. This finding is in line with the main literature on bilingual perceptual development. However, the findings in this study are unusual in how this difference takes places. Although patterns of bilingual delay and acceleration have both been previously attested, the bilingual learners in the current study show both patterns simultaneously, regarding different acoustic properties on the perception of the same contrast. This thesis claims that the difference found between bilingual and monolingual children is the consequence of two factors: (i) the nature of the language input to the learner, and (ii) the interaction between the bilinguals’ linguistic systems. 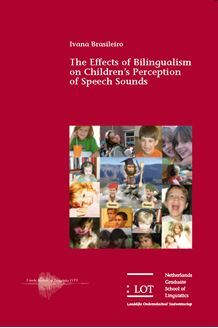 The study presented in this dissertation is of interest to researchers working on bilingualism, language development and speech perception in general.